Showing off two very different pieces of cloisonne today. I like the one on the left because it's a less traditional look. 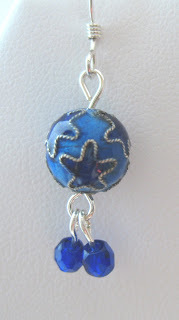 I love the star pattern, it's not something I've seen on cloisonne beads very often. The closionne earrings on the right are pretty cool because of the colors used in the design and the teardrop and dot pattern - I was really drawn to them in the store. These beads for those were from one of my favorite local bead shops, Lily's Beads. 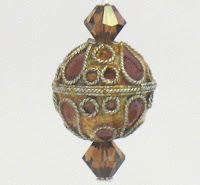 If you're curious about the origins of cloisonne and want to learn more I have some information posted my squidoo lens. I'm Jennifer, one-half of the amazing mother-daughter duo that makes up Weiswomen Creations. © Weiswomen Creations.Carl's Blogger Templates, Design by Pixabella. Distributed by Free Blogger Templates.